Inti Creates reveals Blaster Master Zero 2, available now on Nintendo Switch! All aboard the G-SOPHIA on this intergalactic adventure to save Eve! Inti Creates, the Japanese studio behind Blaster Master Zero, has announced and surprise dropped a sequel for the Nintendo Switch! Revealed during the Spring 2019 Nindies Showcase, Blaster Master Zero 2 is available to purchase and play right now from the Nintendo eShop for £8.99 / €9,99 / $9.99. Blaster Master Zero 2 starts off close to where the first title left off. Destroy mutant scum in a sci-fi action adventure that mixes both side-scrolling and top-down gameplay elements. Blaster Master Zero 2’s story revolves around protagonist Jason helping crew members Eve overcome an infection of mutant cells. With Eve’s body slowly deteriorating from the infection, it’s all aboard the G-SOPHIA on this intergalactic adventure to find a cure! This sequel brings with it new features not seen in the first title. Jason is equipped with a new technique called the Blaster Counter, countering attacks in these hybrid top-down view stages. Utilize this new technique against all new Metal Attackers and be sure to power up the G-SOPHIA along the way. Make the most of your journey by finding upgrades for both Jason and your ship and master the G-SOPHIA’s Gaea System in order to have the most efficient journey. This unique concept allows the ship to gain energy via impact from falls or enemy damage to allow Jason to unlock more sub-weapons. The Blaster Master Zero series is a spiritual successor to Sunsoft’s Blaster Master for the Nintendo Entertainment System. 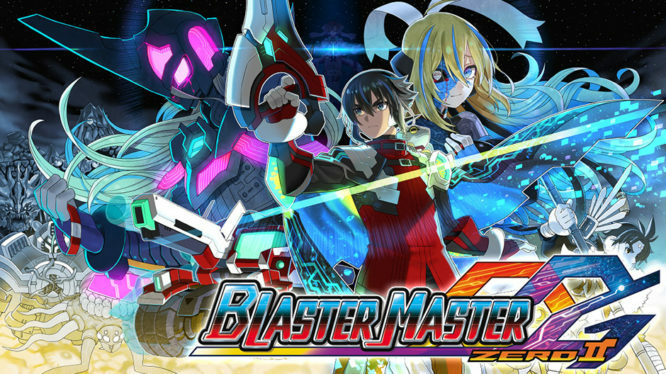 The Blaster Master Zero series brings with it refreshing content that breathes new life into an old title. Blaster Master Zero 2 is available now on the Nintendo Switch eShop for £8.99 / €9,99 / $9.99. Want to get a peak at the action before you dive in? Then check out the launch trailer below!